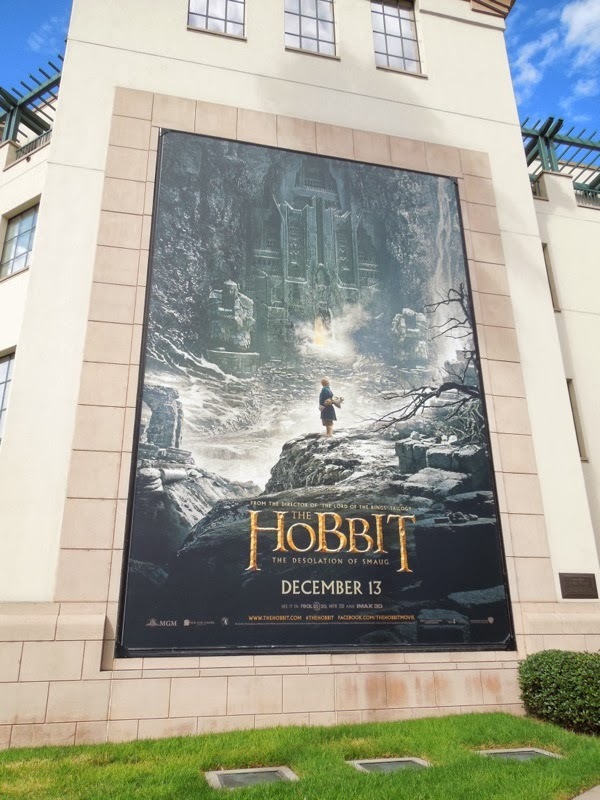 For some, The Hobbit: An Unexpected Journey was a bit of an overly long disappointment and made people question how Peter Jackson could possibly stretch one of the shortest installments in J.R.R. 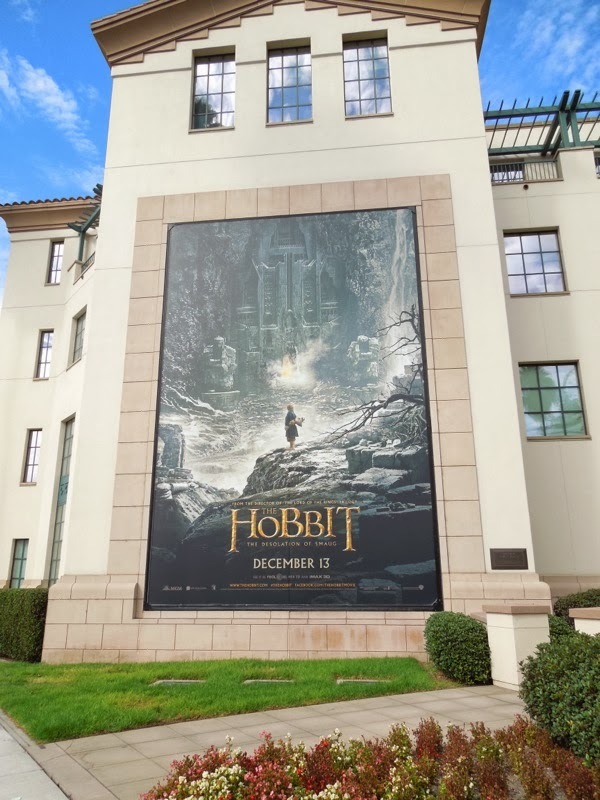 Tolkien's fantasy novels into a new trilogy to follow in the footsteps of The Lord of the Rings movies. 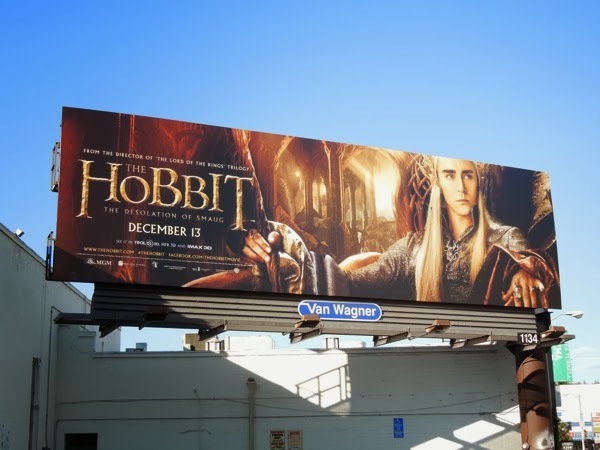 To please LOTR fans it looks like we're going to be seeing a bit of everyone's favorite elf, 'Legolas', in this second movie, The Hobbit: The Desolation of Smaug. 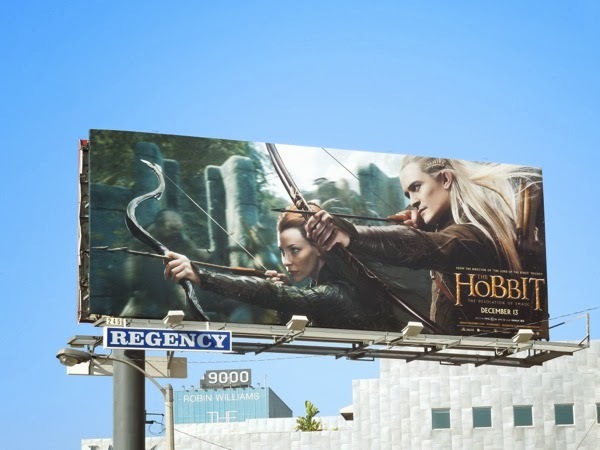 Orlando Bloom will also be joined by Evangeline Lilly as fellow pointy-eared elf, 'Tauriel', who did not feature in the original Hobbit book (so maybe that's how they'll spread the story across three films, by introducing new characters). 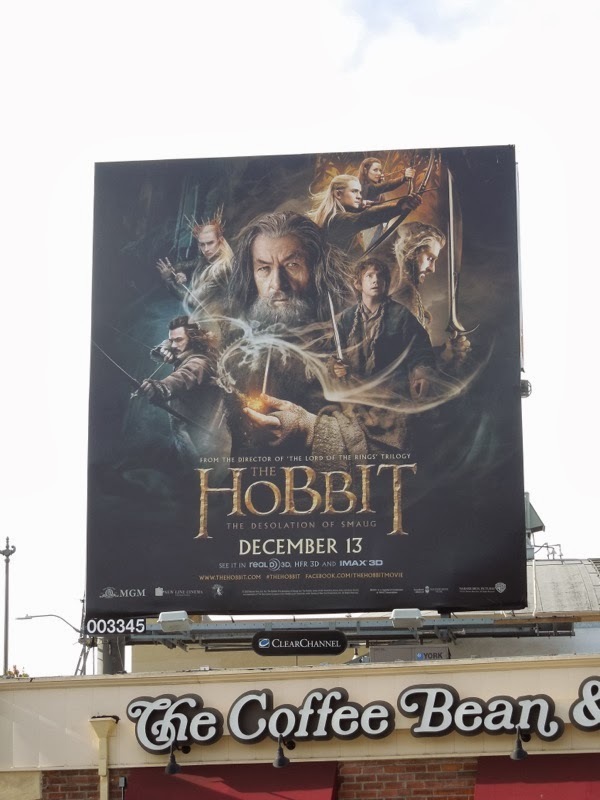 Also in this fantasy movie, Martin Freeman's diminutive 'Bilbo Baggins' continues his adventures with the dwarves and 'Gandalf' to reclaim their treasure from the dragon 'Smaug' (who'll be voiced by Benedict Cumberbatch, who seems to be everywhere these days). 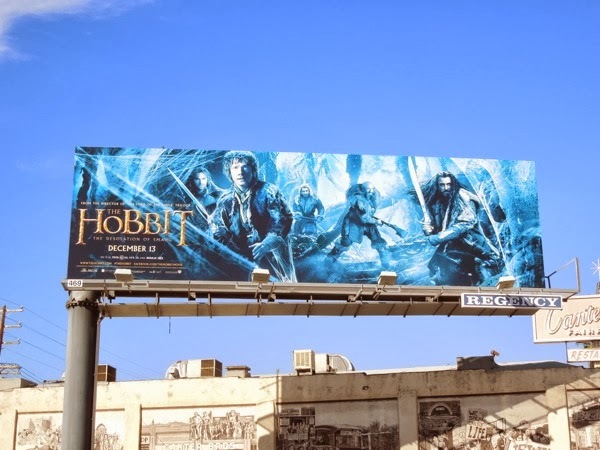 It's nice to see the studio has mixed things up by focusing on the elves in one of these creatives, literally providing something new to freshen the Hobbit ad campaign, otherwise it was in danger of just repeating the past Lord of the Rings billboard designs. 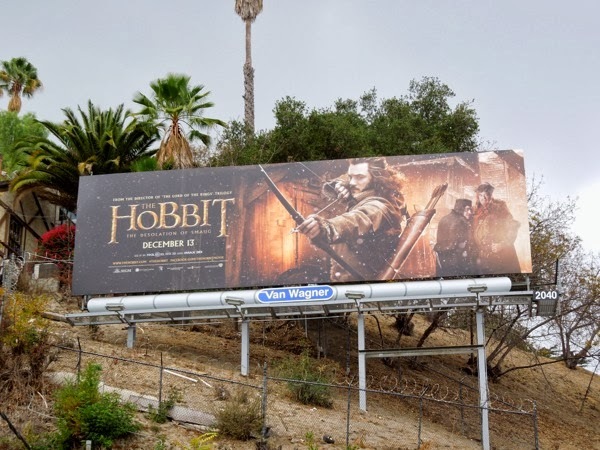 The 'Bilbo' creative was spied at Warner Bros. Studios in Burbank, California on August 31, whilst the 'Tauriel/Legolas' version was spotted along the Sunset Strip in West Hollywood on October 12, 2013. 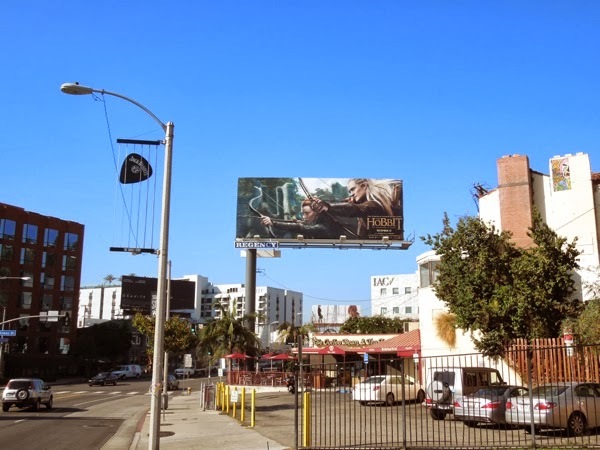 Daily Billboard is sure these aren't the only ad creatives we'll see for the movie sequel as we get closer to the release date, but for now enjoy. 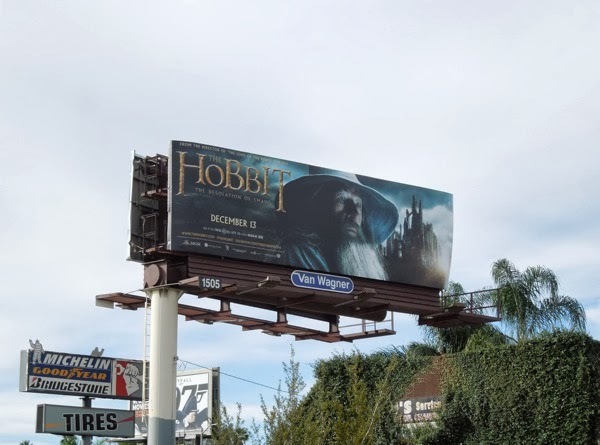 UPDATED: Daily Billboard knew it wouldn't be long until more billboards for the second installment of the Hobbit trilogy surfaced, and it looks like 'Bilbo' and his dwarf friends will be facing off against some nasty spiders in this movie. 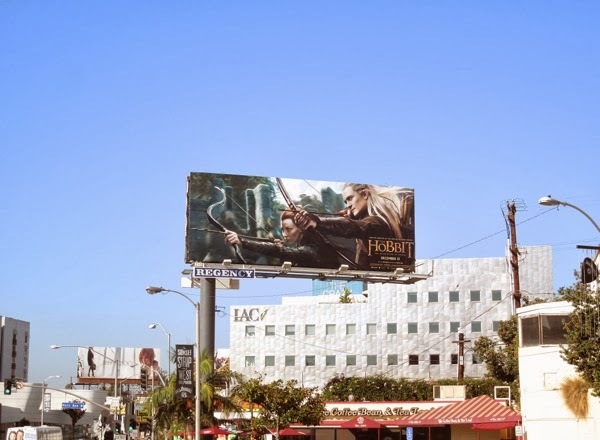 This ad creative was spied along Fairfax Avenue on November 13, 2013 and it's almost a certainty that this is the first of many more executions before the film opens. 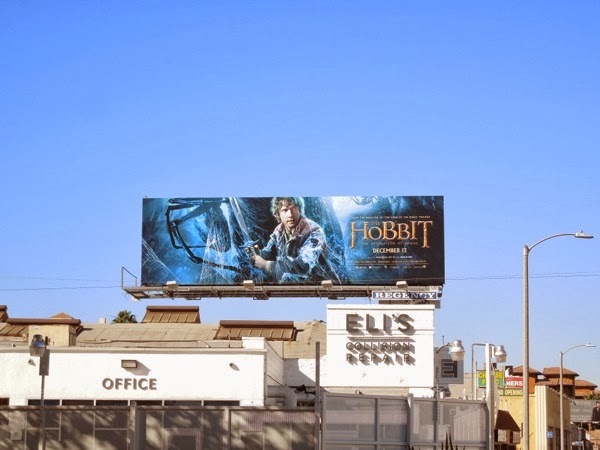 As predicted, here's another creative focusing on Bilbo in the cobwebbed liar of the spiders, spied along 3rd street on November 14, 2013, evoking the giant spider 'Shelob' from The Lord of the Rings Trilogy. 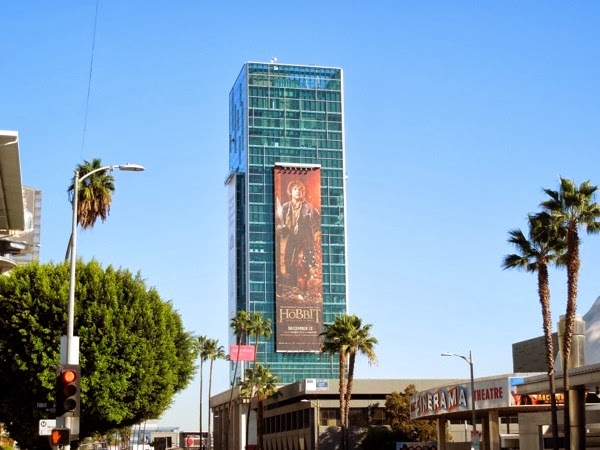 UPDATED: Daily Billboard knew there were more billboards coming, but didn't quite expect the onslaught of billboards overtaking the L.A. skyline in the second half of November. 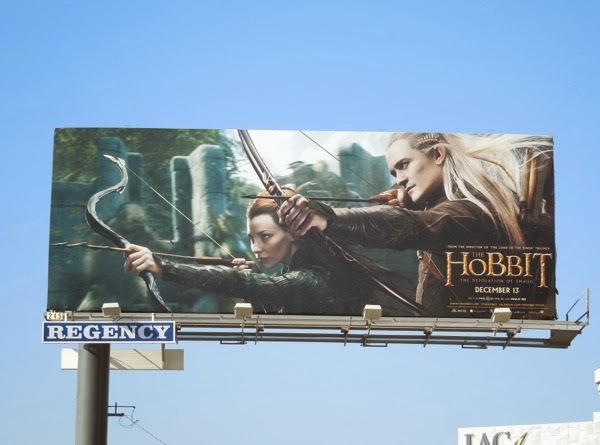 One thing's for sure in the new film there'll be lots more elves, from Legolas to new female warrior elf Tauriel, and even Legolas' father and the Elven King of the Mirkwood, 'Thranduil'. 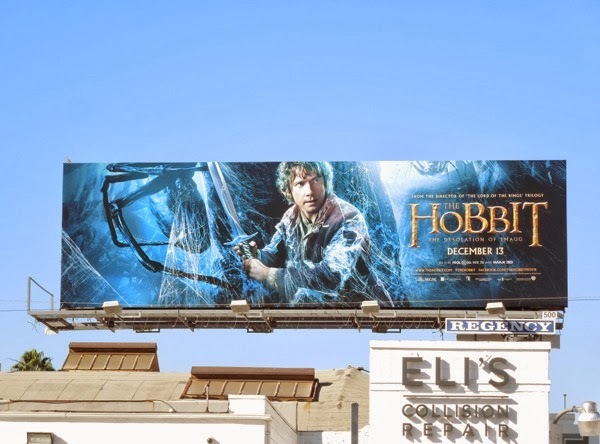 This giant-sized billboard featuring all three Middle-Earth elves ready for battle was snapped on the side of the Sofitel Hotel along Beverly Boulevard on November 24, 2013. 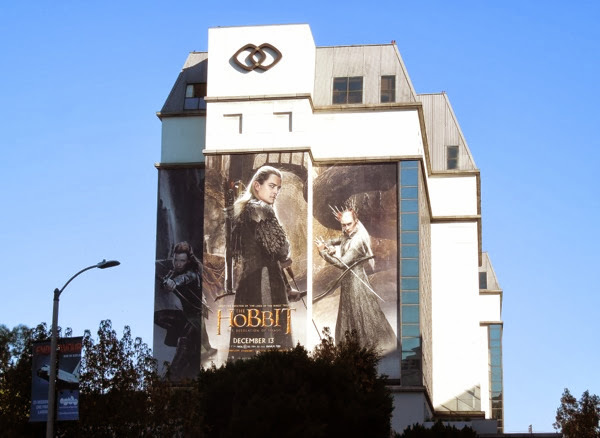 There's also new creatives for new characters like 'Bard the Bowman' played by Luke Evans and everyone's returning favourite wizard, 'Gandalf the Grey'. 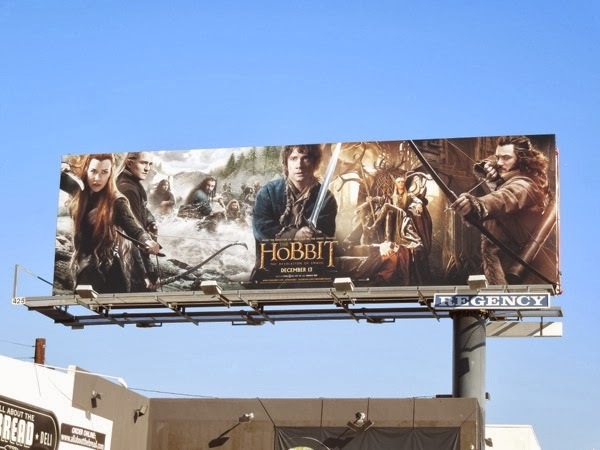 Plus this there's pretty cool ensemble billboard featuring everyone from elves to dwarves and hobbits, which should please everyone. 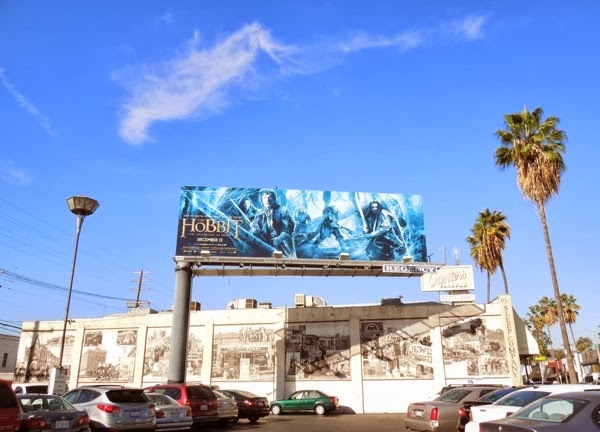 UPDATED: Here's another ensemble cast billboard for The Hobbit 2, this one with a smoke dragon Smaug, spotted along Santa Monica Boulevard on December 2, 2013. 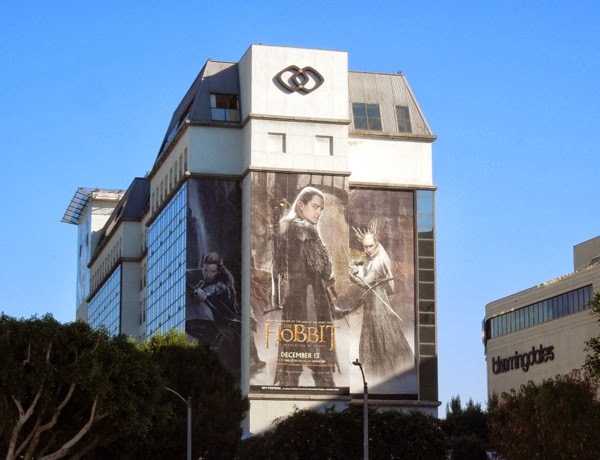 Plus here's another giant-sized billboard for the diminutive Bilbo Baggins spotted on the side of Hollywood's Sunset Vine Tower on December 23, 2013. 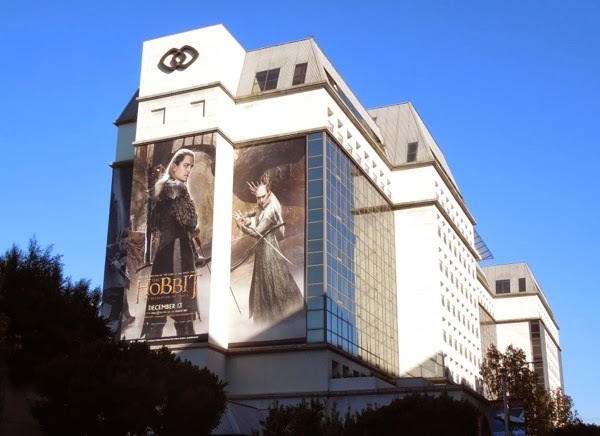 If you're a fan of Middle-earth, be sure to also check out these Bilbo, Thorin and Gandalf movie costumes from The Hobbit: The Desolation of Smaug on display.